As torn as I often feel about social media, such good, real life things can come of it when we use it well. Good things like making a new friend. Ashie came to our house one Saturday afternoon, kit in hand, and while Wyatt and I worked on the kit, Ashie and I quickly discovered how much we have in common. We share a love for Science & Cooking—both the online class and the concepts in real life. We have kids who are about the same age. 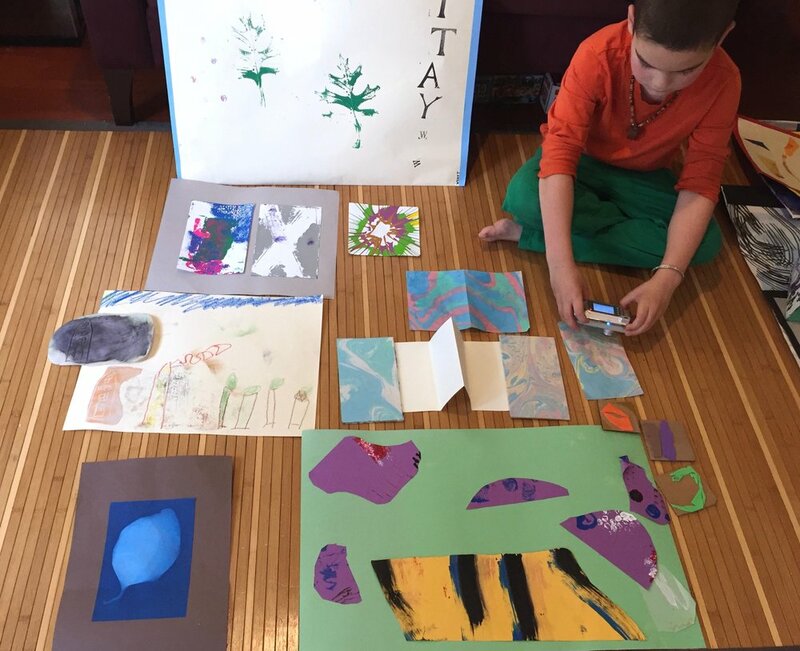 We also think part of bringing up end educating children must include leading them to observe and interact with the everyday world in meaningful ways. A great place to engage is in the kitchen. One of my favorite sayings of Ashie’s is, “Where there is food, there is science,” and her recent TEDx talk on that subject is so inspiring. I didn’t know how we’d contribute in any meaningful way to StemChef’s kit development. To be honest, I was thinking more selfishly when I signed us up: we’d get to do something fun for free. But I have to say, I’m delighted to have actually helped. The scientific principle the first kit explores is pH. One of the experiments involves making cupcakes with the ingredients provided in the kit and then cooking the cupcakes speedily in a microwave. But, we had two issues: (1) we are gluten-free, and (2) we are microwave-free because after our microwave broke a few years ago, we didn’t replace it. Ashie was undaunted, though. With her guidance, we found work arounds, and she decided to include what we did as part of her instructions. Here are some of the photos taken while we were testing the kit. We made a volcano, played with pH testing using natural dye, and made cupcakes. It was a super fun way to introduce Wyatt to acids and bases and how they contribute to a more delicious existence. StemChef is now shipping their kits nationwide! You can learn more about the kits and how to order by visiting the website. I hope that if you celebrate Thanksgiving, you had a wonderful holiday where you basked in gratitude among people you love. And even though on Thanksgiving, you might have sworn you’d never eat again, that feeling has probably worn off by now. Maybe not for pie, but possibly for cake. Or maybe for quick bread? I love Smitten Kitchen’s recipes. I have saved so many of them in my Paprika recipe box, knowing I’ll need to revise them in one way or another to accommodate various dietary restrictions when I try them. Sometimes I remember to note my changes, but more often, I don’t. Wyatt recently remembered one our favorites recipes from this time last year: Mom’s Apple Cake. It’s so good. He didn’t have to remind me twice to add the ingredients to my grocery list so we could bake it over the weekend. I forgot the orange juice, though. I had also forgotten that we don’t own a tube-shaped cake pan. As I pulled out all the ingredients we’d need (minus the orange juice), I thought, “Shouldn’t we HAVE a tube pan?” and soon concluded (for at least the third time) that if we had one, and I used it, I’d also need a cake plate or appropriately large thing to put the cake on and some kind of dome to put the cake under, and probably that wouldn’t be good enough anyway, because gluten-free goods just do not have the staying power that traditional wheat flour-based goods have. I pulled two loaf pans out of the cabinet instead. Bread-shaped cake where we could freeze one of the loaves would be a better choice anyway. 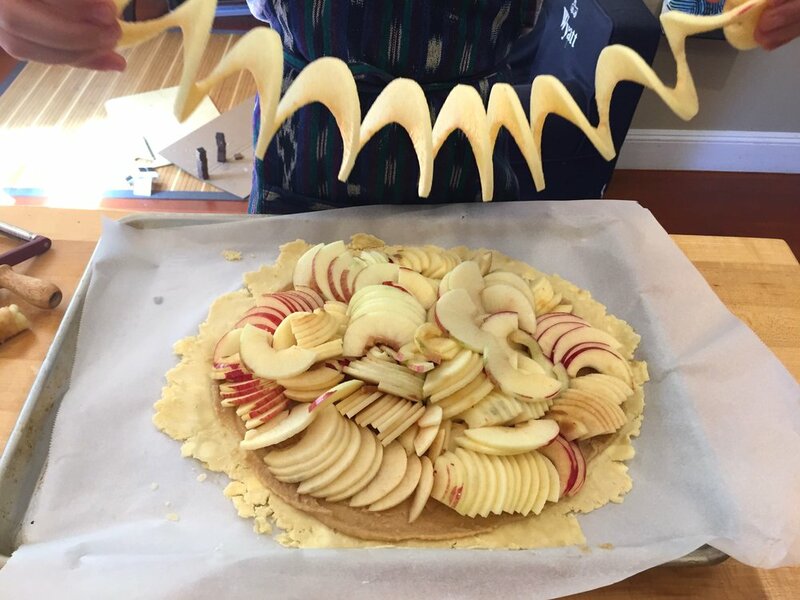 For this, our first Apple Cake of the season, Wyatt argued strongly in favor of using the apple-corer-peeler to prepare the apples. Why? Because it’s fun. I figured we had nothing to lose—the apple chunks called for in the recipe weren’t so great when it came to slicing the bread-shaped cake last year. Also, it’s not like we’d be maintaining the integrity of this recipe in any other way, so why be a stickler about the apples? It was a good call, as it turns out. We substituted the Gluten-Free Girl flour blend for the flour (1-for-1). Because I’m currently dairy-free, we aren’t baking with butter. We chose to use coconut oil because we thought the flavor profile would work with the rest of our changes, and we used 2/3 of the amount called for in the recipe. My friend, Molly, who has more gluten-free baking experience than anyone else I know in real life, taught me that trick when it came to converting a traditional recipe for cookies. It works here, too, likely because gluten-free flours are often not as good at absorbing fats as wheat flour is. We also needed to trade out the granulated sugar because I have verified in real life the blood test result that told me I’m “highly reactive” to cane sugar. I went with 1-for-1 replacement with coconut sugar. And for the orange juice? I grabbed the bottle of Laird’s Apple Jack we use for Chicken Calvados, figuring if booze works so well in Smitten Kitchen’s recipe for Jacked-Up Banana Bread, it would probably be amazing in apple cake. The Apple Cake-ish turned out great. You should definitely try it, with or without the modifications. And I know some of you are also egg-free. I’ve never tried baking gluten-free without eggs, so please leave your tips in the comments so I can learn from you. Heat oven to 350°F (175°C). Grease two loaf pans. If you’re worried about sticking like I am, use coconut-oil greased parchment paper to line the pans. Peel, core and slice the apples 1/8 - 1/4” thick moons. Toss with cinnamon and 5 tablespoons sugar and set aside. Whisk together flour, baking powder and salt in a large mixing bowl. In a separate bowl, whisk together oil, brandy, sugar, vanilla and eggs. Mix wet ingredients into dry ones; scrape down the bowl to ensure all ingredients are incorporated. Cool completely before running knife between cake and pan, and unmolding onto a platter. Or if you used parchment paper, just lift the loaves out and let them cool on a baking rack. * Tip: The apples love to hide uncooked pockets of batter, especially near the top. Make sure your testing skewer or toothpick does a shallow dip below the top layer of apples to make sure it comes out batter-free. Should your cake be browning too fast, before the center is baked through, cover it with foil for all but the last few minutes in the oven. I'm usually not very good at "nostalgia." I didn't keep any of my yearbooks. I think it's generally a mistake to go back to a place just because you used to go there all the time and you loved it. And I always politely decline the opportunity to treasure other peoples' stuff after they pass away. That is, I always decline except for the other week when I didn't. In that instance, I happily accepted my aunt's offer to send me "a box or two" of knitting tools, yarn, books and patterns, much of which came from my late grandmother. In addition to the tools (which are amazing), and a Kelly-sized sweater's worth of gorgeous baby llama and silk yarn (already on the needles, pictured above), there were loads of extras to pass along to my new knitting friends (they were over the moon). Look! I now have a nearly complete set of straight needles, in their own lovely case. There were also musty folders of old, typewritten-fill-in-the-blank patterns from my grandmother's favorite yarn shops. There is not one photo with any of these patterns, most of them are for one size only, and the yarn, yardage, and gauge are absent from the instructions. So, even though I'll never knit these patterns, it was fun to see the names of some relatives for whom my grandmother had knitted various sweaters and to guess which ones she had knitted for me. Everything seemed to be in those folders, including the graph paper grids she had made of cousins' names when knitting their Christmas stockings. The real paper treasures, though are these very old patterns, with revision dates of 1942 and 1918. Make no mistake, times have changed. I can't even legitimately imagine when a reasonable plan for clothing the military involved the Red Cross handing out wool yarn and instructions to women who volunteered to knit "Gloves For Service Men" and "Medium Socks." There's also this pattern, which based on the typeface, must have been from a couple of decades later. That Paris Hat! And Matching Dickey! What stylish Parisian would have been caught without a matching dickey? And what about the dickey? Gone years ago for good reasons, no doubt, but which ones? I have no answers to those questions. I also have no answer to the question I tweeted yesterday to Lucky Peach regarding how much butter I should add to their Sour Cream & Roasted Fig Pie. Wyatt and I had been drooling over the idea of this pie for a couple of weeks, and I finally bought the figs for it yesterday. As they were roasting, I re-read the ingredient list and the instructions, only to find that I was supposed to add an unspecified amount of melted butter to the filling. I guessed 3 Tablespoons. The pie turned out great. I used a frozen gluten-free pie shell from Whole Foods. I used 3 Tablespoons of melted butter. I have no idea whether that was right. I substituted a gluten-free flour blend for the flour. Because I was nervous that the pie seemed very runny (maybe I used too much butter--WHO KNOWS), I used 4 Tablespoons instead of 2. Because I prefer my child not-too-sugared (and because sometimes leftover pie happens for breakfast), I reduced the sugar by 1/4 cup. I baked the pie in our new toaster oven because: (1) we now have a toaster oven; and, (2) the big oven was busy cooking more stuffed tomatoes. The pie was scrumptious. Creamy lemon curd flavor atop the most refined and sophisticated fig newton you can imagine. Bake one soon, while figs are still in season. "I don't want to have my school birthday tomorrow. I'm not going." "Oh dear. That's really too bad. BECAUSE I'M BAKING TWO CAKES FOR IT TONIGHT AND DAD AND I ARE GOING." As you may know, Wyatt turned FIVE this week. And on Sunday evening, he announced his non-attendance at school on Monday just as Marc whisked him, freshly showered, off to bed after a truly epic weekend of fun (and an equally epic melt-down at the end of it all). And, to be honest, two hours later, between baking the first and second cake, I marched down the hall to announce (again) to Marc, "I HATE BAKING." Wyatt and I probably both meant to declare instead, "I'M EXHAUSTED." Part of turning five in Wyatt's kindergarten is having a little celebration in the classroom: A birthday circle, with cake. There are two children's birthdays this week, so that's why we needed two cakes. Wyatt's class has celebrated most of the children's birthdays already. The tradition (as I understand it) is that the family of the birthday child provides the ingredients that a teacher then bakes into a birthday cake. I've seen the cakes—glorious looking bundt cakes topped with a sprinkle of powdered sugar and surrounded by a crown of fresh fruit or flowers. Because Wyatt is gluten-free, he can't have the school birthday cakes, so I bake gluten-free cupcakes that the teachers keep in the freezer for him and defrost as needed. Wyatt doesn't mind missing-out on the birthday cake. The cupcakes I bake for him are really good, and the fact that most baked goods are "gluten" instead of "gluten-free" is something he's used to. But let's be honest. There's something special about being able to share a cake with all your friends on your birthday. In Wyatt's class, there are a couple of children who are gluten-free, and one child who is also dairy-free. So far, it hasn't been possible for the whole class to share a cake. Or two cakes, for that matter. I figured it was time to find a cake recipe that everyone in his class could enjoy. Over the last two weeks, I have baked (and shared) a BUNCH of yellow 6-cup sized bundt cakes. I'm no baker (never mind a cake baker, as evidenced by the fact that I borrowed cake pans for this project), but thanks to a little knowledge from my Science & Cooking class and some careful troubleshooting, I have arrived at a delicious cake recipe that is gluten-free, dairy-free, and comes out of a bundt pan with absolutely no difficulty. The structure of the cake is very good and the crumb seems just right. This cake is a winner. How much of a winner, you ask? Well, Wyatt told me when I picked him up from school, "Mom! We fooled the other gluten-free kids! They said to the teachers, 'Why did you give me cake? I can't have cake.' But they could! They were SO HAPPY and ate it all up. We even got seconds! Let's fool them again next year." My heart melts a little every time I think about how "we fooled them," and I feel a twinge of regret for all the times I declared, dripping spatula raised high in the air, "I HATE BAKING." An appreciative audience is one of the best reasons I can think of to bake a cake (or two). Like most delicious birthday cakes, there's nothing health-food-like about this one. Also, because there aren't any children with nut or egg sensitivities in Wyatt's class, I only solved for gluten and dairy in this recipe. If anyone else wants to take on the challenge of further substitutions, please share in the comments the changes you make and how the cake turned out. I developed my recipe based on the recipe for Yellow Cake in Gluten-Free Girl American Classics Reinvented and the recipe for Yellow Layer Cake in America's Test Kitchen's How Can It Be Gluten Free. I love both of these cookbooks. But having made both of these cake recipes in the past, I felt that that neither recipe would give me the exact cake I wanted (and both recipes include sour cream, anyway). So I did a little research about non-dairy sour cream alternatives, drew on the aspects I liked best about each cake recipe, tinkered with ingredients, and eventually, I got the cake I wanted. As is the case with most "alternative baking" recipes, there are a few steps you need to take before actually baking the cake, so I'll lay those out first. Make your Gluten-Free Flour Blend: I like Gluten Free Girl's blend, and that's what I used. You'll need 400 grams of millet flour, 300 grams of sweet rice flour, and 300 grams of potato starch. Combine all three ingredients in a large bowl and then whisk until well-blended. If you prefer, you can buy the blend, already mixed, here. 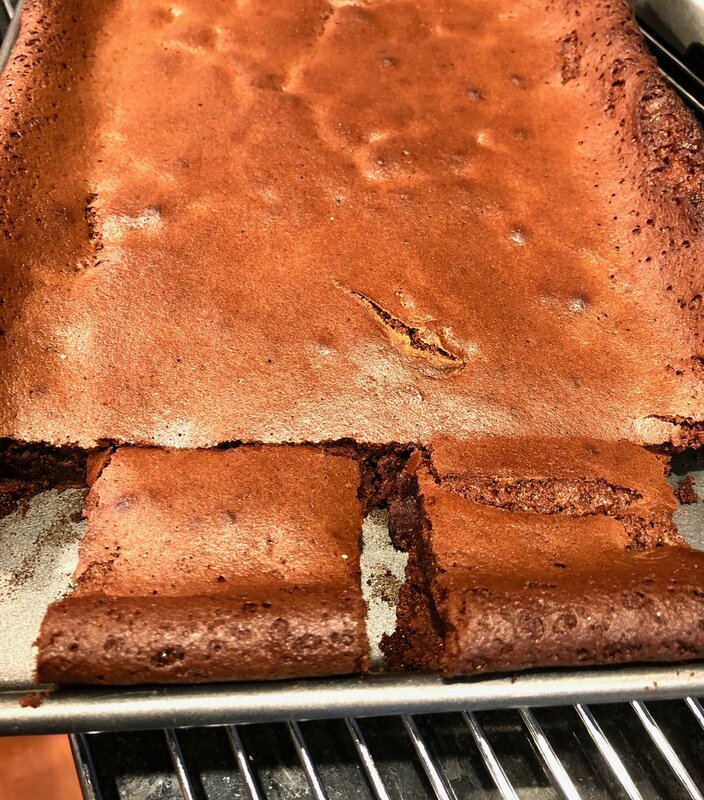 Make your Baking Goop: I had a terrible problem with my cakes sticking, and many good store-bought baking sprays include flour, which isn't an option when baking gluten-free. But this mixture works like a charm. Take equal volumes (I used 1/4 cup) of your gluten-free flour blend, a neutral-flavored oil, and shortening. Blend them (in a blender or with a whisk) until smooth. Store the mixture in a jar with a lid and refrigerate it when not in use to avoid separation. Before you bake, take the jar out of the refrigerator so that it can warm up a bit. Dip a pastry brush into the mixture and paint the goop evenly and thoroughly over the pan to prepare it before baking. Put the cashews in a bowl and cover them with boiling water. Soak for 1 hour, and then drain. Place the drained cashews in a high-speed blender (I used a Vitamix). Add the fresh lemon juice, vinegar, water, and salt. Blend the mixture on high speed until it is incredibly smooth. Store the "cream" in an air-tight container in the refrigerator. It will probably thicken a bit once it has chilled. You can store it in the refrigerator for about a week or freeze it for longer storage. I portion it in silicone ice cube trays before freezing. ... and then it's CAKE BAKING TIME! I used a 6-cup bundt pan (and to avoid over-filling the pan, I made a few cupcakes with the extra batter that didn't fit), but you could use another pan if you like. I prefer to weigh my ingredients when I bake because it is so much more accurate and yields the best results. But I have included rough volume measurements, in case you don't have access to a baking scale. Place your baking rack in the middle position in your oven and preheat the oven to 325 degrees. With a pastry brush, paint your Baking Goop all over the inside of the pan(s) you will use. Brush a thin layer of goop thoroughly and evenly over the entire baking surface of the pan(s). In a small or medium-sized bowl, whisk flour blend, baking powder, salt, and baking soda until combined. Fit your stand mixer with the whisk attachment. Whip the egg whites and cream of tartar on medium-low speed until the mixture is foamy. It will take about a minute. Then, increase the speed to medium-high and whip the whites into billowy clouds for another minute. With the mixer running, gradually add half of the sugar and keep whipping the mixture until the whites make stiff, glossy peaks. It will take another two or three minutes. Transfer the mixture to a large bowl. Return your now empty mixer bowl to the stand mixer. Add the egg yolks and vanilla, and whip them for about 30 seconds on medium speed (until they are well-blended). With the mixer running, gradually add the rest of the sugar, and then increase the mixer speed to high. Keep whipping the mixture for another two minutes or so, until it becomes very thick and pale yellow. Reduce the mixer speed to medium, add the coconut oil, and then the cashew sour cream. Whip for another 30 seconds or so. Reduce the speed to low and gradually add the flour blend mixture. Mix until thoroughly combined (about a minute), scraping the bowl with a rubber spatula as needed. Using a rubber spatula, stir one-third of the whipped egg whites into the batter you just made. Then, gently fold in the rest of the whites and keep folding the batter until you can't see any more white streaks in the batter. Pour the batter into your prepared pan(s), leaving at least 1 1/2 inches of space at the top of the pan. Rap the pan(s) sharply on the counter (to dislodge any bubbles that may have gotten trapped), and bake them. Rotate the pan 180 degrees half-way through baking time, and test for doneness by inserting a toothpick. Once the toothpick comes out clean, the cake is done. In my oven, the 6-cup bundt cake takes about 40 minutes. Cupcakes take about 25 minutes. Let the cake cool for 10 minutes in the pan, and then turn it onto a plate or platter. Let it cool completely before slicing and eating. All three of us have been enjoying our new sourdough bread. We even baked more loaves of bread yesterday! This time, Wyatt got to complete all of the baking steps with me. I daresay that our bread was even better this time around! But as it often goes with new pets, the care and feeding of the pet is on the parent. In this case, taking care of the sourdough is on me. It had been so long since I had kept sourdough starter alive that I had forgotten how I used to do it. I went online to jog my memory, and boy did those searches jog it. If you search online for "how to maintain sourdough starter," you will find more exquisitely detailed posts than you would have ever thought imaginable. Amateur bread baking, sourdough in particular, is a thing, and most people who choose to maintain a starter and then write about it tend to have strong opinions about the process. But here's the problem with strong opinions about maintaining sourdough starter: everyone's kitchen is different. The temperature of the kitchen, the temperature of the water, and the exact composition of the water changes from house to house. What works perfectly for someone else may not work for me, or you. Exactly how much to feed a starter and when to feed it is dependent on a lot of variables that I am not interested in attempting to control. I want to keep my sourdough starter alive, so I feed it regularly. But I figure that since I was able to grow it on my counter over a few days, thanks to a little bit of care and a lot of benign neglect, it will be no big deal to start another one if this one dies. If you have never maintained a sourdough culture before, you can read about the process in traditional sourdough bread here. This series of posts on Phickle, Sourdough Starter School, is really informative. The photos are also great, but remember that like all other gluten-free baking projects, gluten-free sourdough starter looks different from traditional sourdough. Even though traditional and gluten-free sourdough batters look different, the bubbles of happy microbes are the same in both. The more bubbles I see and the more popping I hear, the more active my starter is. If there are almost no bubbles, my starter has either just been fed or may need to be fed again. And after I have fed my starter, I give it a sniff. The smell is always very mild. But by the time of the next feeding, the smell is much stronger and more sour. Sometimes there's even a layer of liquid on top of the starter. A strong sour smell and this liquid are signs that my starter is hungry for fresh flour and water. There seems to be no consensus on how often to feed a starter. Sandor Katz recommends daily feeding, and so does David Asher in his cheesemaking book. Amanda Feifer at Phickle is also in the once-a-day camp. But many other people feel strongly that twice a day feedings are necessary. The first few days I had my starter, I fed it once a day, before I went to bed. But I started to notice that by feeding time, it was looking and smelling like it was pretty...hungry. So I started feeding it twice a day: morning and evening. I noticed with twice daily feedings, the starter looked more lively by the end of the day. It's possible, though, that if I had just increased the size of the one feeding, that would have fixed the problem. At the first feeding to maintain the starter, I took a clean, empty, quart sized mason jar. I measured the weight of it, in grams, and wrote that tare weight on a piece of masking tape, and stuck that on the jar. I put the jar on the scale, zeroed the scale, and added 20g of sourdough starter to the jar. I measured 40g of flour (be sure to feed the starter gluten-free flour mix, NOT the grain-free one in American Classics Reinvented), dumped that in the jar with the starter. I measured 40g of non-chlorinated, room-temperature water, and I dumped that in the jar with the starter and the flour. I mixed all of it up vigorously, and screwed the lid on LOOSELY. In the evening, I weighed the jar and removed all but 20g of the sourdough starter. This was easy to do, because I already knew how much my jar weighs when it is empty. (Pretend your empty jar weighs 420g . Put the jar on the scale and keep removing starter until the scale reads 440g. Now you have 20g of starter in the jar.) I then added 40g of flour and 40g of non-chlorinated, room-temperature water, mixed it all vigorously, and screwed the lid back on LOOSELY. Then I just repeated this process--keeping 20g of starter, and adding twice that amount of flour and of water at every feeding. I composted the starter I removed. The thing about sourdough is that you have to remove some of the starter at every feeding or else you and your kitchen will quickly become overwhelmed by sourdough starter. Also, removing excess starter helps to keep the microbe population in check and control the level of sour in your baked goods. A few feedings in advance of when I would be baking again, I began to build up the size of my starter by increasing the size of the feedings. I kept 20g of starter, but fed it 60g of flour and 60g of water. And at the next feeding, I kept 30g of starter and added 90g of flour and 90g of water. At that point, I had more than enough starter for my recipe plus 20g to maintain in the jar. This week, I'm experimenting with keeping the starter in the fridge. I fed the starter a couple of days ago, let it hang out on the counter for a couple of hours after the feeding, and then I put the jar in the refrigerator. My plan is to take it out of the refrigerator and revive it with a few feedings before our next baking day. Gluten-Free Wild Sourdough Bread: We did it! "Is that MY loaf of bread? It looks so good...THIS BREAD IS SO GOOD! I need two pieces, please. Two pieces with extra butter." Making yogurt and baking sourdough bread were my first forays into fermentation. 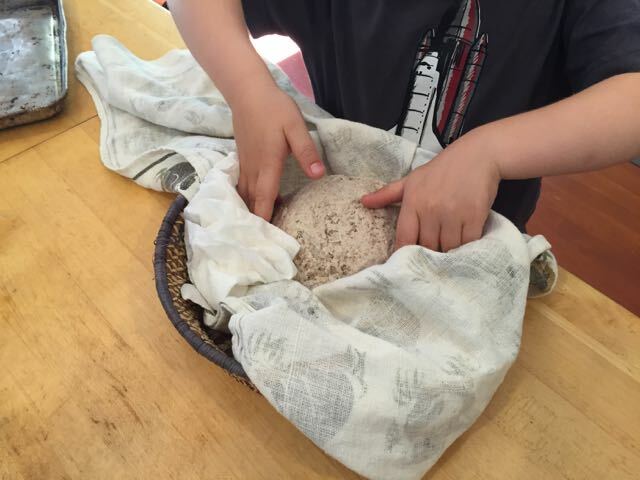 When Wyatt was about eight months old or so, I was really into baking sourdough. And I got really good at it. I bought my culture from Cultures for Health. I baked bread all the time, we had sourdough pancakes every Sunday, and I cared for the culture almost like a pet. But just after Wyatt turned a year old, we learned that he (and we) were gluten-intolerant. That knowledge sounded the death knell of the sourdough starter and the end of the Bread Extravaganza of 2012. Over the next couple of years, I tried a few recipes here and there for gluten-free sourdough bread, but they mostly produced dense, boozy-smelling bricks. Awful stuff. Since then, we've tried various bakeries' gluten-free breads, and they're great in a pinch, if toasted. But I don't love the texture that xanthan and guar gums give gluten-free baked goods, so we don't eat commercial breads (or any bread) that often. When I saw that Gluten-Free Girl's American Classics Reinvented included a true sourdough bread recipe, I pre-ordered the book. I figured that if the recipe worked, the entire book would have been worth buying. We got our book on Tuesday, and we started our sourdough on Wednesday. * We baked on Monday. First, we mixed teff flour and non-chlorinated water. We mixed it very well. The next day, we began the process of removing most of the flour and water combination, and replacing it with new flour and water. We repeated this process for a few days. Once we had something that looked and smelled like sourdough, we made pancakes with the flour and water we removed. On Day 5, we checked the texture, and we were ready to strengthen our starter in preparation for baking. But first, more pancakes. This batch was better than the first batch. I prepped the dough after Wyatt was in bed and let it sit overnight. In the morning, we divided our dough for two loaves. Look! There's no kneading necessary, because there's no gluten network to develop. Shaping the dough is easy. Wyatt woke up the bread to put it in the oven. Preparation for a little steam bath towards the end of baking. After mixing teff flour and non-chlorinated water, we let the mix sit for a day, and then began the process of, every day, removing most of the previous mixture and adding more flour and water. After a few days, I made pancakes with some of the "extra" starter. The first time I made pancakes, I used a sourdough pancake recipe I had found. But by the second time, I had read Sandor Katz's more relaxed approach to sourdough in the Art of Fermentation, and I made up my own recipe. I took 2 cups of the starter, added a teaspoon of baking soda (the baking soda binds with some of the lactic acid, making a slightly sweeter pancake), a tablespoon or so of coconut flour and two beaten eggs. The pancakes were terrific. Making the actual bread was easy. It's gluten-free, so there's no point in kneading it. You could knead all day and you'll never create the gluten network of a traditional bread! After shaping and a final proof, we baked each loaf in a dutch oven, with a little steam of water at the end of baking time. If you like the idea of gluten-free sourdough bread, I think you'd be smart to pick up a copy of American Classics Reinvented and start your sourdough right away. If you want to try building your own wild sourdough starter but don't need it to be gluten-free, check out this post from Wild Fermentation, and maybe consider adding some teff flour to your mix to speed things along. Meanwhile, we have a new culture in the house. We are both taking a breather from baking right now as I learn what our new pet needs to stay bubbly. *There was a point this weekend where we had Shankleesh draining, paneer being pressed, sourdough starter bubbling, and pizza dough rising. It was a busy and somewhat messy weekend over here.